The 1st edition of this competition will be held in Prague, Czech Republic. 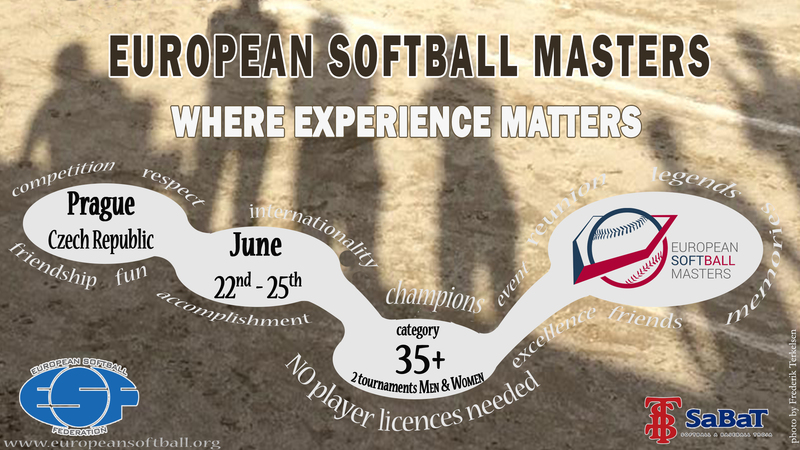 European Softball Masters (in fastpitch) is an official ESF competition, established in 2016. There are no player licences required; however, all players must be 35 years of age or older on the first day of the tournament. Players origin, nationality, home team, passport really doesn't matter. The players only must be 35 years of age or older! Both men's and women's teams may enter this competition, as there will be two tournaments played simultaneously. ESF manages the administration and appointment of umpires itself, so there are no responsibilities regarding umpires for the teams/clubs/federations. 1)	Download the Entry Form for Cups 2016, fill it in and have it confirmed by your National Federaion (or any European National Federation). 2)	Follow the instructions on the entry form to send it to the ESF in order to sign up for the tournament. All entries must be recevied before April 30th. To learn more about the competition, head over to Specific Competition Regulations, or address your questions to the ESF Communications Director, Helena Novotná at hnovotna@europeansoftball.org.